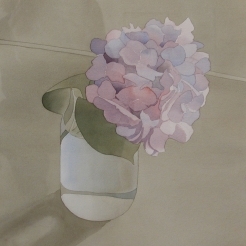 John Berggruen Gallery is pleased to present an exhibition of watercolors by the late San Francisco-based artist Mark Adams. The works included in the exhibition range in date from 1977 to 1991 and display Adams’ quintessential still-lifes and landscapes, all of which were painted with his luminous and compelling style and superb draftsmanship. There will be an opening reception held on Thursday, December 6 from 5:30-7:30pm. Mark Adams is best remembered for his versatility as an artist, possessing talent in a diverse array of artistic media including tapestry, stained glass, oil painting, mosaic, drawing, watercolor, and printmaking. Early in his artistic career he focused on tapestry and stained glass. By 1962 Adams had two solo exhibitions of his tapestries at the de Young Museum and the San Francisco Museum of Modern Art. He completed tapestry commissions for various institutions, including the San Francisco International Airport. Adams later took an interest in stained glass, which he considered an extension of his work with tapestry and his enthusiasm for liturgical art. By 1975, Adams grew frustrated with the limitations of his craft and the lack of complete control he had over the actual fabrication of his work. Drawn to the idea of small, intimate, and personal works that he could manage from beginning to end, he began a new venture in watercolor. Adams soon realized he could incorporate his techniques of flat planes of color as he had in tapestry and stained glass by using a wash to create his desired spatial effects, along with continuing his ideas of transparency and luminosity. He favored the quotidian subjects that exemplified his life, depicting them in such a way as to evoke a sense of nostalgia. Adams eventually learned to deemphasize his precise technique as a means to communicate his excitement for the subject he was portraying. Mark Adams was born in Fort Plain, New York in 1925 and died in San Francisco in 2006. He attended the Hans Hofmann School of Fine Arts in New York City in 1945 after studying for two years at Syracuse University. He spent the next few years traveling between New York and California before he settled in the San Francisco Bay Area in 1952. Adams married fellow artist Beth Van Hoesen in 1953, and completed a four-month apprenticeship in Aubusson tapestry with the acclaimed Jean Lurçart in Saint-Céré, France in 1955. After returning to the Bay Area, he and Van Hoesen settled in a 1909 Noe Valley firehouse, which the couple had converted into living and studio space in 1959. The San Jose Museum of Quilts and Textiles recently organized the first retrospective of Adams’ tapestries. Adams taught at such institutions as the University of California, Davis, the San Francisco Art Institute, and the Arrowmount School in Tennessee. He completed numerous commissioned tapestries and stained glass windows including a thirty-foot long tapestry for the Weyerhaeuser Co. headquarters in Tacoma, Washington and stained glass windows for Grace Cathedral and Temple Emanu-El in San Francisco. Adams’ works are included in the permanent collections of the San Francisco Museum of Modern Art, the de Young Museum, the Dallas Museum of Art, as well as in numerous other institutions. For further information and photographs, please contact Tatem Read at 415.781.4629 or tatem@berggruen.com.